The World Cup? No, I am talking about the Rainy Season 2006 Tokyo - we are officially in a month-long wet season starting as of yesterday. Unlike the FIFA World Cup, our rainy season may not necessarily end on July 9. Unlike the FIFA World Cup, the real heat will not reach its peak during the season, but after the rainy season when the notorious Tokyo summer arrives. Just how ready am I for that. 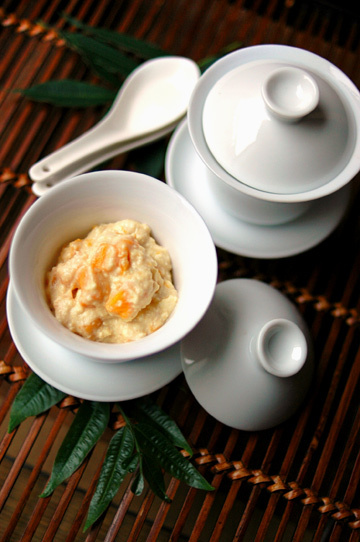 A tropical fruit with a Japanese touch: Mango with Tofu Cream, recipe by Kazuwo Hida (in her 2002 book, in Japanese). 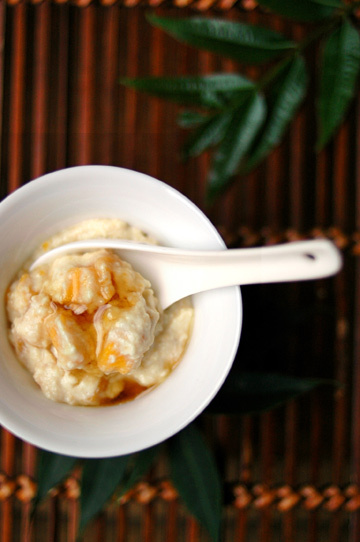 Cubed mango flesh is tossed in drained and pureed silken tofu combined with a bit of cream, a bit of white sesame paste, a dash of soy sauce, and a pinch of salt. The ripe fruit is meant to make enough sweetness in this light treat, although I liked it better with a drizzle of honey. This may not be your typical mango dessert, but it can make an easy-to-prep little nosh. This looks like a delicious treat to have while watching the rain fall. It will be a great silver lining to the rain clouds! Thanks for the great photos. Wow, I can't imagine a match of mango with tofu cream. It's good ? I wanna taste it. That looks like an interesting deseert. The Socceroos are playing Japan first round... I wonder how they will go. This looks like a simple yet delicious and cooling summer treat. I must try it! Hi, thank you all for the comments! clotilde - I don't do online chat, sorry, but you are welcome to drop me a line at shewhoeats@yahoo.com if you have any particular matter to talk about! jenjen - oh well, the roos were certainly outplaying! I feel your rain. I'm in Seoul, Korea and we got our first taste of the monsoon yesterday. But, it looks as though you have a sweeter dessert to get you through the season. We have been having some of that tropical rain here in northern Argentina as well. Being from Seattle, and thinking I understood what rain was all about I was a bit shocked I have to say. That icecream looks lovely I must say! and I love tofu icecream! Gustad Mody - correct, the cream itself doesn't have any sweetener added. Although mangoes did their part for sweetness, and I ate it with a little honey on top.